… whatever kind of day it was. Good Night Feelings invites little ones and big ones to round out their day together during picture-enhanced heart-to-heart sharing. Any sad moments, strong or subtle frustrations, spurts of fear, and ripples of joy – all are completed and washed away during this safely guided and respectful exchange. Each feeling has a right to exist. When you listen carefully to your own feelings and the feelings of others, the feelings can explain interactions and heal wounds that logical thinking could never resolve. 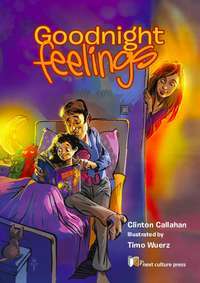 Good Night Feelings could become the most exciting book on your child's shelf because each time you read it together the stories emerge with surprising depth and freshness.